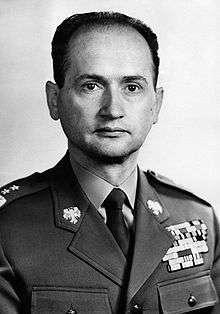 Wojciech Witold Jaruzelski (Polish: [ˈvɔjt͡ɕɛx jaruˈzɛlskʲi]; 6 July 1923 – 25 May 2014) was a Polish military officer and politician. He was First Secretary of the Polish United Workers' Party from 1981 to 1989, and as such was the last leader of the People's Republic of Poland. He also served as Prime Minister from 1981 to 1985 and the country's head of state from 1985 to 1990. He was also the last commander-in-chief of the Polish People's Army (LWP). He resigned from power after the Polish Round Table Agreement in 1989, which led to democratic elections in Poland. Jaruzelski was chiefly responsible for the imposition of martial law in Poland on 13 December 1981 in an attempt to crush the pro-democracy movements, which included Solidarity, the first non-Communist trade union in Warsaw Pact history. Subsequent years saw his government and its internal security forces censor, persecute, and jail thousands of journalists and opposition activists without charge; others lost their lives during these same events. The resulting socio-economic crisis led to the rationing of basic foods such as sugar, milk, and meat, as well as materials such as gasoline and consumer products, while the median income of the population fell by as much as 40 percent. During Jaruzelski's rule from 1981 to 1989, around 700,000 people left the country. Wojciech Witold Jaruzelski was born on 6 July 1923 in Kurów, into a family of Polish gentry. He was the son of Wanda (née Zaremba) and Władysław Mieczysław Jaruzelski, and was raised on the family estate near Wysokie (in the vicinity of Białystok). He was educated in a Catholic school during the 1930s. World War II commenced on 1 September 1939 with the invasion of Poland by Germany, aided by the Soviet invasion of Poland sixteen days later. These resulted in the complete defeat of Poland by October, and a partition between Soviet and German zones of control. Jaruzelski and his family fled to Lithuania and stayed with some friends there. However, a few months later, after Lithuania and the other Baltic states were forcibly incorporated into the Soviet Union, Jaruzelski and his family were captured by the Red Army and deported to Siberia. In 1940 at the age of sixteen, Jaruzelski was sent to the Kazakh Soviet Socialist Republic, where he performed forced labour in the Karaganda coal mines. During his labour work he was stricken with snow blindness and suffered permanent damage to his eyes as well as his back. His eye condition forced him to wear dark sunglasses most of the time for the rest of his life, which became his trademark. Jaruzelski's father died in 1942 from dysentery. His mother and sister survived the war (his mother died in 1966). Jaruzelski was selected by the Soviet authorities for enrollment into the Soviet Officer Training School. During his time in the Kazakh Republic, Jaruzelski wanted to join the non-Soviet controlled Polish exile army led by Władysław Anders, but in 1943, by which time the Soviet Union was fighting in Europe against Germany in the Eastern Front, he joined the Polish army units being formed under Soviet command. He served in this Soviet-sponsored First Polish Army during the war. He participated in the 1945 Soviet military takeover of Warsaw and the Battle of Berlin. By the time the war ended that year, he had gained the rank of lieutenant. He "further credited himself in Soviet eyes" by engaging in combat against the non-Communist Polish Home Army, from 1945 to 1947. After the end of the war, Jaruzelski graduated from the Polish Higher Infantry School, followed by graduation from the General Staff Academy. He joined Poland's Communist party, the Polish United Workers' Party, in 1948 and became an informant for the Soviet supervised Main Directorate of Information of the Polish Army using the cover name Wolski. In the initial post-war years, he was among those who fought the Polish anti-Communists ("cursed soldiers") in the Świętokrzyskie region. A BBC News profile of Jaruzelski states that his career "took off after the departure [from Poland] in 1956 of the Soviet Field Marshal, Konstantin Rokossovsky", who had been Poland's Commander in Chief and Minister of Defence. Jaruzelski became the chief political officer of the Polish armed forces in 1960, its chief of staff in 1964; and Polish Minister of Defense in 1968, four years after he was elected to be a member of the Central Committee of the Polish United Workers' Party. He benefited from an antisemitic campaign in the army, during which more than 1000 Jewish officers were demoted or expelled. Even the non-Jewish minister of defence, Marshal Marian Spychalski was persecuted. Jaruzelski obtained his post. 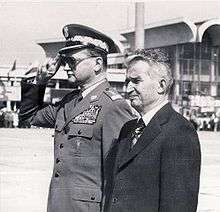 In August 1968 General Jaruzelski as the defence minister ordered the 2nd Army under General Florian Siwicki (of the "LWP") to invade Czechoslovakia, resulting in military occupation of northern Czechoslovakia until 11 November 1968 when under his orders and agreements with the Soviet Union his Polish troops were withdrawn and replaced by the Soviet Army. In 1970, he was involved in the successful plot against Władysław Gomułka, which led to the appointment of Edward Gierek as General Secretary of the Polish United Workers Party. There is some question whether he took part in organizing the brutal suppression of striking workers; or whether his orders to the Communist military led to massacres in the coastal cities of Gdańsk, Gdynia, Elbląg and Szczecin. 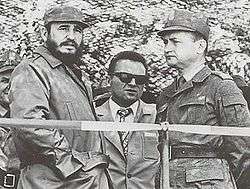 As Minister of Defense general Jaruzelski was ultimately responsible for 27,000 troops used against unarmed civilians. He claims that he was circumvented, which is why he never apologized for his involvement, but he had an option of resigning open to him, especially after the resignation of foreign minister Adam Rapacki, and Jaruzelski did not. Jaruzelski became a candidate member for the Politburo of the Polish United Workers' Party, the chief executive body of the party, obtaining full membership the following year. On 11 February 1981, Jaruzelski was named Chairman of the Council of Ministers (Prime Minister). On 18 October, Stanisław Kania was ousted as First Secretary of the Central Committee of the Polish United Workers' Party after a listening device recorded him criticising the Soviet leadership. Jaruzelski was elected his successor, becoming the only professional soldier to become leader of a ruling European Communist party. A fortnight after taking power, Jaruzelski met with Solidarity head Lech Wałęsa and Catholic primate Józef Glemp, and hinted that he wanted to bring the church and the union into a sort of coalition government. However, his intention was to crush Solidarity. As early as September, while he was still merely prime minister, he met with his aides to find an excuse to impose martial law. On 13 December, citing purported recordings of Solidarity leaders planning a coup, Jaruzelski organised his own coup by proclaiming martial law. 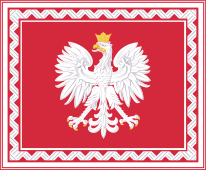 A Military Council of National Salvation was formed, with Jaruzelski as chairman. A BBC News profile of Jaruzelski contends that the establishment of martial law was "an attempt to suppress the Solidarity movement." According to Jaruzelski, martial law was necessary to avoid a Soviet invasion. In a May 1992 interview with Der Spiegel, Jaruzelski said: "Given the strategic logic of the time, I probably would have acted the same way if I had been a Soviet general. At that time, Soviet political and strategic interests were threatened." However, at a press conference in September 1997 Viktor Kulikov, former supreme commander of Warsaw Pact forces, denied that the Soviet Union had either threatened or intended to intervene. According to Politburo minutes from 10 December 1981, Yuri Andropov stated "We do not intend to introduce troops into Poland. That is the proper position, and we must adhere to it until the end. I don't know how things will turn out in Poland, but even if Poland falls under the control of Solidarity, that's the way it will be." Jaruzelski also claimed in 1997 that Washington had given him a "green light", stating that he had sent Eugeniusz Molczyk to confer with Vice President George H. W. Bush and Bush had agreed with Molczyk that martial law was the lesser of two evils. Whether this meeting with the American vice president occurred is disputed. While it is erroneously cited, Harvard historian Mark Kramer has pointed out that no documents support Jaruzelski's claim. Historical evidence released under Russian President Boris Yeltsin has been brought to light indicating that the Soviet Union did not plan to invade Poland. In fact, Jaruzelski actually tried to persuade the Soviets to invade Poland in order to support martial law, only to be sternly turned down. This left the Solidarity "problem" to be sorted out by the Polish government (see also Soviet reaction to the Polish crisis of 1980–1981). However, the exact plans of the Soviet Union at that time have never been determined. Jaruzelski, however, has justified cracking down by alleging that the threat of Soviet intervention was quite likely had he not dealt with Solidarity internally. This question, as well as many other facts about Poland in the years 1945–1989, are presently under the investigation of government historians at the Institute of National Remembrance (Instytut Pamięci Narodowej, IPN), whose publications reveal facts from the Communist-era archives. Additionally, there are numerous confirmations from Czech army officers of the time speaking of Operation Krkonoše, plan of armed invasion of Poland, because of which many units of the Czechoslovak People's Army were stationed on highest alert, ready for deployment within hours. In 1982 he helped reorganize the Front of National Unity, the organization the Communists used to manage their satellite parties, as the Patriotic Movement for National Rebirth. In 1985, Jaruzelski resigned as prime minister and defence minister and became the Chairman of the Polish Council of State — a post equivalent to that of head of state of Poland. However, his power centered on and firmly entrenched in his coterie of "LWP" generals and lower ranks officers of the Polish Communist Army. The policies of Mikhail Gorbachev stimulated political reform in Poland. By the close of its tenth plenary meeting in December 1988, the Polish United Workers Party was forced by spreading labour unrest to approach leaders of Solidarity for talks. From 6 February to 15 April 1989, negotiations were held between 13 working groups during 94 sessions of the roundtable talks. These negotiations "radically altered the shape "of the Polish government and society", and resulted in an agreement which stated that a great degree of political power would be given to a newly created bicameral legislature. It also restored a post of president to act as head of state and chief executive. Solidarity was also declared a legal organization. During the following Polish elections the Communists were allocated 65 percent of the seats in the Sejm, Solidarity won all the remaining elected seats, and 99 out of the 100 seats in the fully elected Senate were also won by Solidarity-backed candidates. Jaruzelski won the presidential ballot by one vote on 19 July 1989. Jaruzelski was unsuccessful in convincing Lech Wałęsa to include Solidarity in a "grand coalition" with the Communists, and Jaruzelski resigned his position as general secretary of the Polish United Workers Party on 29 July 1989. Mieczysław Rakowski succeeded him as the general secretary of the party. The Communists' two allied parties broke their long-standing alliance, forcing Jaruzelski to appoint Solidarity's Tadeusz Mazowiecki as the country's first non-Communist prime minister since 1948. Jaruzelski resigned as Poland's leader in 1990. He was succeeded by Wałęsa, who had won the presidential election on 9 December. On 31 January 1991, General Jaruzelski retired from the army. In an interview conducted in 2001, Jaruzelski said that he believed Communism failed, and that he was now a social democrat. He also announced his support for then-President Aleksander Kwaśniewski, as well as future Prime Minister Leszek Miller. Both Kwaśniewski and Miller were members of the Democratic Left Alliance, the social democratic party that includes most of the remains of the PUWP. In May 2005, Russian President Vladimir Putin awarded a medal commemorating the 60th anniversary of victory over Nazi Germany to Jaruzelski. Other former leaders awarded the medal include former Romanian King Michael I. Czech President Václav Klaus criticized this step, claiming that Jaruzelski was a symbol of the Warsaw Pact invasion of Czechoslovakia in 1968. Jaruzelski said that he had apologized and that the decision on the August 1968 invasion had been a great "political and moral mistake". On 28 March 2006, Jaruzelski was awarded a Siberian Exiles Cross by Polish President Lech Kaczyński. However, after making this fact public Kaczyński claimed that this was a mistake and blamed the bureaucracy for giving him a document containing 1293 names without notifying him of Jaruzelski's presence within it. After this statement, Jaruzelski returned the cross. On 31 March 2006, the Institute of National Remembrance (IPN) charged him with committing Communist crimes, mainly the creation of a criminal military organization with the aim of carrying out criminal acts — mostly concerned with the illegal imprisonment of people. A second charge involved inciting state ministers to commit acts beyond their competence. Jaruzelski evaded most court appearances citing poor health. In December 2010, Jaruzelski suffered from severe pneumonia, and in March 2011, he was diagnosed with lymphoma. His wife Barbara threatened to file for divorce in 2014, saying she had caught his nurse Kasia in a compromising position with him. Jaruzelski died on 25 May 2014, in a Warsaw hospital after suffering a stroke earlier that month. Prior to his death, he reportedly requested last rites by a Catholic priest. President Bronisław Komorowski and former Presidents Lech Wałęsa and Aleksander Kwaśniewski as well as hundreds of other Poles attended his funeral mass at the Field Cathedral of the Polish Army in Warsaw on 30 May. Wałęsa and Komorowski, who were among the thousands imprisoned during the crackdown on Solidarity in 1981, both stated that judgment against Jaruzelski "would be left to God". Jaruzelski was then cremated and buried with full military honors at Powązki Military Cemetery in Warsaw, near the grave of Bolesław Bierut, the first Communist leader of Poland after World War II. The decision to bury Jaruzelski at Powązki, the resting place of Polish soldiers killed defending their country since the early 19th century, resulted in protests. Jaruzelski married Barbara Halina Jaskólska (1930–) in 1961. They had a daughter, Monika who was born on 11 August 1963. Monika has a son, Gustav. The BBC reported in 2001 that "for some Poles — particularly the Solidarity generation — he is little short of a traitor", even comparing his philosophy of "a strong Poland within a Soviet dominated bloc" to Vidkun Quisling's philosophy of a similar status for Norway within the Nazi controlled hemisphere. Meanwhile, opinion polls as of 15 May 2001 suggested that a majority of the Polish people were open to agreeing with his explanation that martial law was implemented to prevent a Soviet invasion. Available documents indicate that Jaruzelski actually lobbied for Soviet intervention. In interviews in Russian media (Rossiyskaya Gazeta for example) he has been presented as the harbinger of Poland's democracy. Croatian writer Slavenka Drakulić described Jaruzelski as a "tragic believer in Communism who made a pact with the devil in good faith". Różnić się mądrze (English translation: To Differ Wisely) (1999). "Być może to ostatnie słowo (wyjaśnienia złożone przed Sądem)" (English translation:"It may be the last word (explanations given in the Court)") (2008). Medal "For participation in the battle for Berlin"
1 2 3 4 CIA’s Historical Review (24 October 1997). "Cold War era analysis" (PDF file, direct download 12.2 MB). Soviet – East European Military Relations in Historical Perspective Sources and Reassessments. The Historical Collections Division (HCD) of the Office of Information Management Services. 1 (1): 18 of 44. Retrieved 26 May 2014. 1 2 3 4 5 6 7 8 9 10 11 12 13 14 15 16 17 18 19 20 "Profile: Gen. Wojciech Jaruzelski". Cable Network News (CNN). Archived from the original on 13 June 2008. Retrieved 24 November 2008. 1 2 3 4 5 6 7 8 9 10 Repa, Jan (16 May 2001). "Profile: Poland's last Communist leader". British Broadcasting Corporation (BBC) News. Retrieved 26 November 2008. ↑ Jaruzelski, prime minister of Poland: selected speeches – Wojciech Jaruzelski, Robert Maxwell – Google Books. Books.google.ca. 2006-11-03. Retrieved 2014-05-28. 1 2 3 4 Sebetsyen, Victor (2009). Revolution 1989: The Fall of the Soviet Empire. New York City: Pantheon Books. ISBN 0-375-42532-2. 1 2 3 Green, Peter S. (27 May 2001). "An Aging Ex-Dictator Who Refuses To Recant". The New York Times. p. 2. Retrieved 29 November 2008. 1 2 3 4 5 6 "Wojciech Witold Jaruzelski". Encyclopædia Britannica Online. Retrieved 24 November 2008. 1 2 3 Szporer, Michael. "General Wojciech Jaruzelski". Global Museum on Communism. ↑ Das war psychische Folter Der Spiegel, 11 May 1992. ↑ Minutes of CPSU CC Politburo, 10 Dec 1981, Document No. 21, p. 165. ↑ Jane Perlez, "Warsaw Journal: Old Cold War Enemies Exhume One Battlefield", The New York Times, 11 November 1997, p. 14. 1 2 Butturini, Paula (30 July 1989). "Solidarity Foe Is New Polish Party Chief". Chicago Tribune. Warsaw. Retrieved 14 July 2013. ↑ "Stanisław Ciosek: Gen. Jaruzelski to wielki Polak. Powinniśmy być mu wdzięczni". Wiadomosci.onet.pl. Retrieved 2014-05-28. 1 2 "Gwardianie generała". Wiadomosci.onet.pl. 2013-07-26. Retrieved 2014-05-28. ↑ 29 Dec 2010 (2010-12-29). "Wojciech Jaruzelski 'admitted to hospital with pneumonia'". Telegraph. Retrieved 2014-05-28. ↑ Herald, Catholic. "Do not judge Jaruzelski, say Polish archbishops". CatholicHerald.co.uk. Retrieved 2014-05-28. ↑ Poland's Gen. Wojciech Jaruzelski dies at 90. Warsaw, Poland (AP), 25 May 2014. ↑ "Jaruzelski gets highest Soviet prize". Reading Eagle. Moscow. AP. 5 July 1983. Retrieved 7 September 2013. 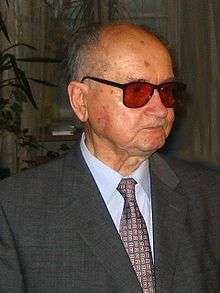 Wikimedia Commons has media related to Wojciech Jaruzelski.